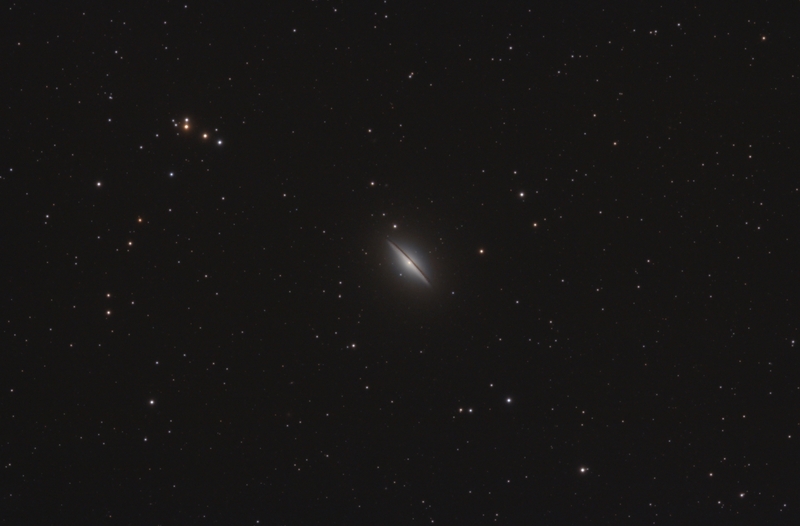 This image of M104 was taken from my favorite dark sky site, SCO, the observatory of the Halifax Centre of the RASC. The site has a roll-off as well as a comfy warm room and dark skies. The seeing was really bad, but after one of the worst winter observing seasons in recent memory there was no way I was going to waste a weekend clear night. To give you an idea of how bad the seeing was, the stars in the image have undergone two passes of star reduction and they are still a little large. Deconvolution helped with the galaxy but it still a little soft. Click on the image to see a 100 % crop of the galaxy rotated 90 degrees and click again to return to the wider field. Calibration, stacking, arcsinh stretch in Images Plus . Masked LR deconvolution sharpening and contrast enhancement applied in Images plus. Masked colour enhancement and saturation boost.